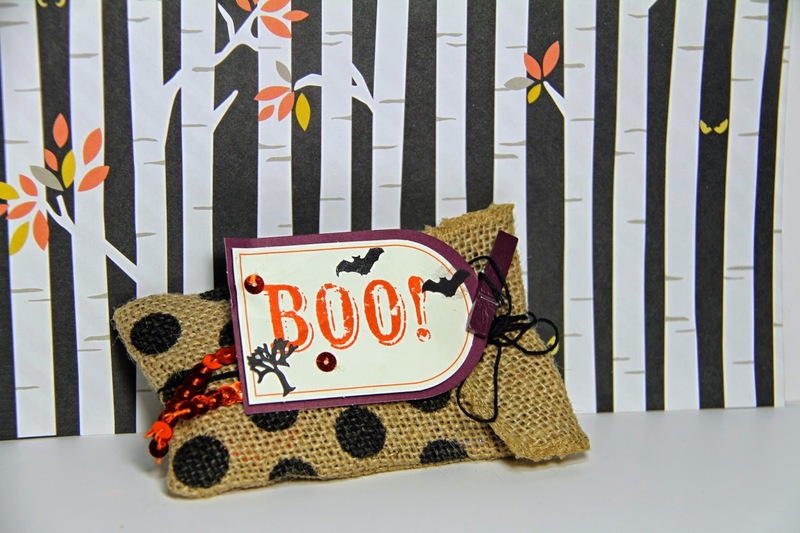 I'm having fun with my Paper Pumpkin kit this month, making these cute treat Halloween treat bags. This year's monthly kits include more product for the same price and often refills are available. I've already purchased two more refills for my September kit so I'll have plenty of treat bags for little buggers stopping by our home during All Saints Eve! Check here if your interested in signing up for My Paper Pumpkin For more ideas on how to use this month's kit to create even more Halloween projects, check out over 20 ideas for Paper Pumpkin on Pinterest. Reminder: Still time to sign up for this Sunday's Card class. Sunday, October 5, starting at 1:30 pm. Sign up now! Here's a look at the 8 cards we'll be making. Everyone needs a stash of general cards to have on hand for different occasions. Spend a fun afternoon with snacks, chats, and making these cards. 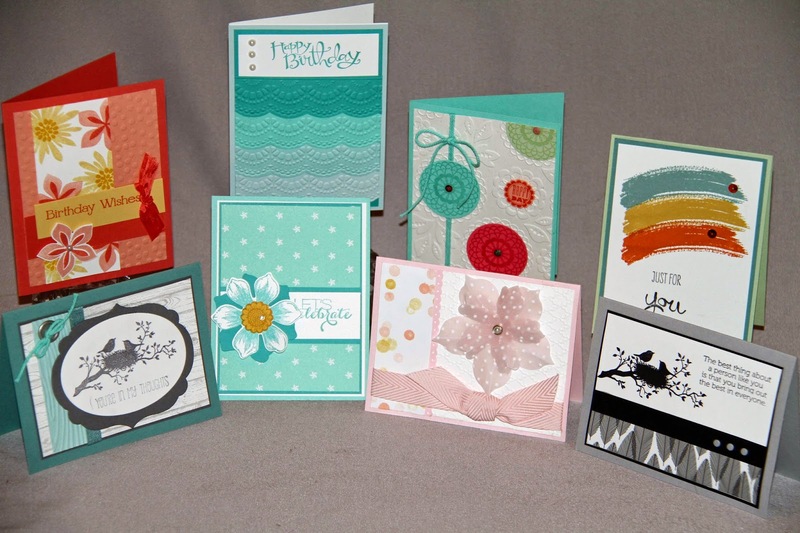 This collection of cards uses a variety of the new designer papers, the new In-colors, and new rubber stamp sets, polymer set, which I'm beginning to favor more and more, and new punches, dies, and embossing folder. Here's a close up of one of the cards we'll make. 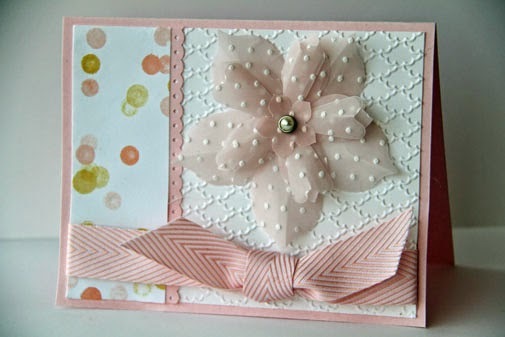 This raised flower card is made with vellum, new ribbons and designer papers. The center is a silver Candy Dot base brad painted gold with a marker to match the gold dots in the designer paper, and then the brad was embellished with a pearl center. Start by using Pink Pirouette and a brayer, Brayer ink onto white velum card stock. Once dry, we'll use the Flower Frenzy Bugz L Die to cut the flowers. The velum card stock can be creased from just about the center of the flower to the tip of the petal with a bone folder and then pinch the velum card stock together, which gives it a slightly raised effect. The big shot die let you cut several flowers at once. Next, all four of the cut flowers used to make one flower fit into the Perfect Polka Dots embossing folder for a single run through the embossing machine. Before mounting on the Pink Pirouette base layers, attached the flower to the Whispers White layer so the brad back was hidden. For more card ideas, look at a few more July 2014 swaps and card samples from the convention display boards on the photos link in my Meetup site. Also, sign up to register for this class on my Meetup site at this link to ensure you're first to hear about new classes. The Meetup site has been down over this week end, so check back at this Meetup link if you're unable to get in the first time. Stamps: You can add a sentiment of your choice inside No stamping on the card front. Do you want to know why I'm able to do classes this year, even with a very busy work schedule? It's because Stampin’ Up! is making it easier and easier for demonstrators and customers to get projects done quickly – just what we need with our busy schedules and lack of storage space for all our supplies. Check out previous posts to see some of the Halloween kits and winter watercolor kits available for a short time. These on page 36 and 37 of the new Holiday Mini catalog, if you’re one of my regular customers. If you need a copy of the catalog, download a copy here.